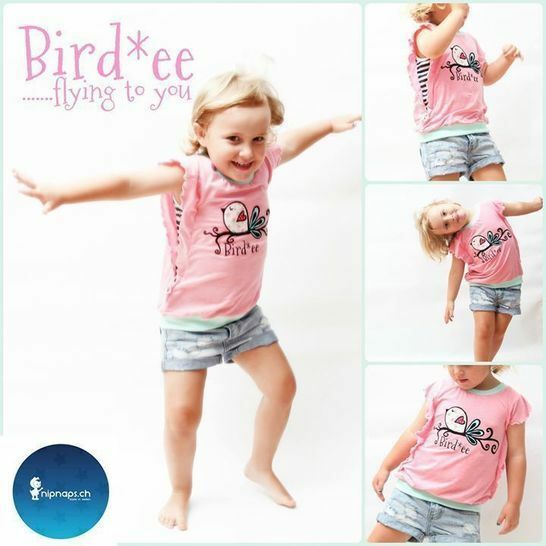 Bird*ee is a super sweet summer top with ‚wings’. It is available in double sizes 62/68 (0-6 months) to 170/176 (14+years) with two length options; as a tunic or top. For a really sweet spring or autumn look, the option of long sleeves is included in the pattern. All nipnaps patterns are very beginner friendly and are always tested for size and fit by a team of 60 seamstresses from all over the world, ranging from complete beginners to absolute pro’s, to ensure a perfect fit in all sizes. This ebook comes with over 20 pages of photographic step by step sewing instructions, from laying the pieces on the fabric before cutting all the way to a free plott download! It also contains a colour coded PDF Pattern in A4 Format!